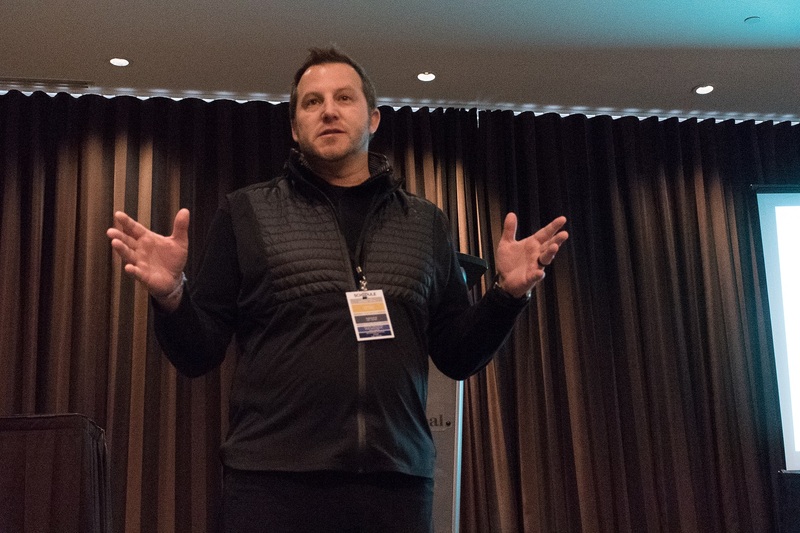 Around 40 JMSB students packed into the Sheraton Hotel on René Lévesque Boulevard for the John Molson Sports Marketing speaker series conference on March 24. The event was organized by JMSB students and featured three speakers, including Rob Campana, Jonathan Mailhot and Chris Moynes. Each spoke for about an hour, with Campana and Mailhot presenting students with a case study where students had to come up with ideas to fix a problem that affected the speaker’s business. Moynes was the keynote speaker. At around 1 p.m., Campana, who is the founder of Flag Plus Football league in Montreal, spoke to students about starting his sports league and the challenges that came with it. A graduate of JMSB, Campana started Flag Plus Football when he was 19, in 2005. There were only 18 teams when the league started in 2005, but now there are over 300. Since then, league has become a luxury brand for recreational flag football in Montreal. As a former student, Campana was happy to speak at the conference and share his knowledge with the eager crowd. After giving his talk, Campana presented the students with a case study related to his own company. Flag Plus Football grows about 10 to 15 per cent each year, according to Campana. However, low profit margins make it hard to expand the business. Campana looked to students for solutions to his problem. After 30 minutes, the students came back with ideas, which Campana listened to and gave feedback on. Some students thought that one route Campana could go, is license his league’s services to other recreational leagues for a royalty fee. Jonathan Mailhot is in charge of advertising, media planning and innovation for the Montreal Canadiens. The next speaker was Mailhot, who is the head of advertising, media planning and innovation for the Montreal Canadiens. Mailhot spoke to the group about his role with the Canadiens, as well as how he got there, having started out as a student in JMSB. In his role with the Habs, Mailhot helps develop advertising campaigns, as well as create promotional videos for the team’s various events and media platforms. For instance, Mailhot is in charge of the season launch campaign, which lets fans know the Habs are back. Mailhot said he remembers being a student and attending these conferences. For Mailhot’s case study, he asked students to figure out how the Montreal Canadiens could make their Bell Centre tour more enticing to people. He also wanted to see if students could tie the tour into a social cause that would help the organization give back to the community. He said despite students only having 30 minutes, he was impressed with the ideas the students came up with. The third and final speaker was Moynes, who is the creator of One Sports Entertainment Group. The firm helps professional athletes manage their assets and make the right investments so they don’t go bankrupt. Moynes talked about his early years as an employee at his father’s company which also dealt with asset management. There, he would help manage the assets of some of hockey’s biggest names. He then went on to work at RBC and later started his own company. Each student got to go home with two of his books, The Pro’s Process and After the Game, which discuss how athletes can avoid financial instability later in their careers and after retirement. While speaking about his career path, Moynes left students with some motivational words. After his talk, a networking cocktail was held for students to formally meet each of the three speakers.